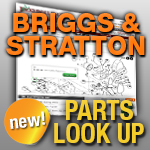 Briggs and Stratton Pumps: Jacks is your Place! We have the Pumps you need, with fast shipping and great prices! For lawn mower parts and accessories, think Jacks! If Using a Screw Connect Style Hose Connection You May need the 22 X 14mm Adapter.